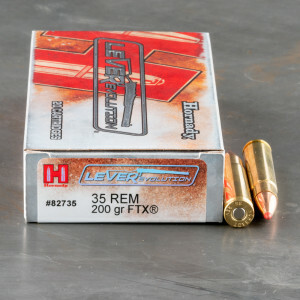 The 35 Remington is another of Remington's fine line-up of rimless cartridges; this one being the last in regular production. Introduced in 1906 and originally produced for use in Remington's semi-auto Model 8 rifle, it has now passed its centennial celebration with grace. 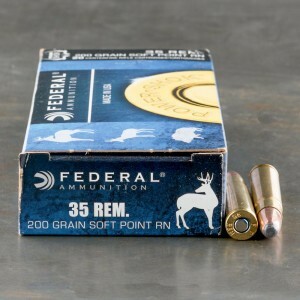 With a .358 inch bullet sporting a large frontal area, the round-nose bullet is a solid choice for deer, bear, and even elk. Of course, long-range shots should probably be avoided. 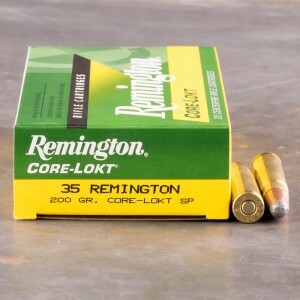 The 35 Remington’s larger bullet will give adequate penetration and energy dump. 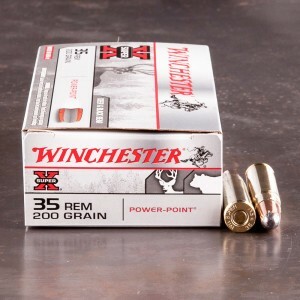 The cartridge has been chambered by most rifle manufacturers over the years. Today, it is popular in Marlin lever actions as well as in single-shot hunting pistols such as the TC Contender. Modern cartridge loadings usually launch a 200 grain bullet at about 2000 feet per second, putting plenty of energy on target. The round is at home in the American South with hog hunters as well as those hardy souls seeking bear, moose, and big bucks in Maine's woods - both places where a quick-handling, hard-hitting round is vital.